Repeatability of metrics and genuine insight are the primary drivers for football analytics and the best work in the field is rigorously tested after the collation of long series of data. What we see happening in front of us week by week are just fragments of the greater storyline but it is always fascinating to go through the individual game data and this weekend’s Premier League games have been a marvellous reminder of why one-game hard statistical analysis isn’t really a thing. The ultimate small sample, one game, can throw up many a quirk, as this weekend amply showed. Manchester City boss Manuel Pellegrini could be sacked in the summer after their Champions League exit, says BBC football expert Robbie Savage. Why not Guardiola, Robbie? Or maybe Alex Ferguson? Plenty more media commentary has had a quick look at the table and spotted how close Arsenal and Man Utd are to the top two and in particular City. They have then presumed that City’s position in the top two is under threat and they are vulnerable to challengers. The numbers just don’t support this analysis. The trouble for City is mainly in perception, which is of course functionally irrelevant. Their season last year was so fluid and goal laden that any normal regression would look underwhelming. That they have regressed yet still maintained huge shot dominance is actually impressive. Their shot ratios over this year and last are now almost identical and it has been their raw conversion that has fallen off. 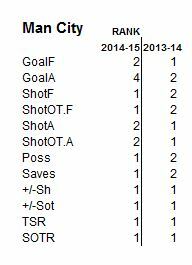 No other team in the league approaches 8 shots and 3 shots on target over and above their opposition. Their current record of 18-7-5 is only six points behind their comparative record from last year of 21-4-5 and whilst I could easily be wrong I will be surprised if the owners rescind Pellegrini’s contract. Certainly they shouldn’t. There is no Champions League heritage to protect, disappointment there has no prior measure of success and the team remains very talented and strong. If I have any concern regarding Man City moving forward it is more centred around the playing squad and the long comfortable contracts that have been generated by FFP compliance. There are two ways of looking at this: 1) that long term they are potentially demotivating and too comfortable for aging players or 2) there is a degree of loyalty in the higher echelons at City. One suspects the former, but any shred of the latter could extend Pellegrini’s stay. Regardless, NYCFC may well have a hell of a side in a couple of years. Mancini only went due to disagreements with key personnel both on pitch and off and the last coach to get sacked from one of the Premier League’s mega-clubs after following up a hugely successful season with something less dominant was Carlo Ancelotti at Chelsea. I hope and think City won’t make the same error. Three away wins on Sunday recorded by Chelsea, Man Utd and Everton and three more cracking examples of one game skew. Between them, the three teams scored seven goals from ten shots on target, which when compared to an realistic expectation of about three goals shows how pleasant a trip each team had. The Hull v Chelsea game was particularly interesting as after a quick start the half ended at two a-piece and the shots stat were 14-3 in Hull’s favour, something which bore no resemblance to anything we’ve seen from Hull all season. The Courtois triple save upped the Hull on target shot count to eight, equal to Chelsea’s total shot count and us number watchers were left scratching our heads as to how Chelsea managed to limp over the line. You couldn’t even blame score effects, as little happened between 2-0 and 2-2 and once again we wonder if Chelsea are tiring. Their cushion is significant and necessary but it is worth noting that they suffered a similar dip at this point last year and it cost them any chance of the title. They should have enough to repel challengers but many more moderate efforts such as this could see dropped points and raised eyebrows. Juan Mata has once more set about his annual task of winning over a manager and made a decent fist of it in this match with two quality finishes. The stat angle on this one was once more that it was a shot freak; this time tying the season low of 13 shots in a game (with Chelsea v Man City). And what we can quickly notice here is that both games involve top four challengers. A quick calculation shows that matches involving top four contenders average around 11.6 shots per team per game, which is low compared to a league average of 12.8. All that makes a deal of sense, shot counts are likely to get bloated against worse teams and the top seven includes teams managed by Koeman, Van Gaal and Mourinho, each of whom appears to value pragmatism over shooting affluence. So, for Man Utd: six shots, four on target, including the penalty and two goals. As we saw last week, Van Gaal appears to do a good line in efficiency in shooting and they shut down Liverpool almost entirely even before the disparity in player numbers, much as they had Tottenham last week. There was always the possibility that Utd could gel at some point and impress and these two recent wins certainly indicate that they may well have arrived. For Liverpool, I will always object to the use of Raheem Sterling on the right flank and as expected, his influence was negligible from that position. There may well be pragmatism in other teams near the top of the table but it’s been in precious supply at Tottenham as witnessed by their thrilling, rollercoaster display against Leicester. I say “thrilling and rollercoaster” when I could quite easily go for “bewildering and chancy” as the easy concession of multiple goals now means Tottenham have conceded more than Sunderland, Villa, Hull, West Brom, Everton, Palace and every other team outside the relegation zone bar Newcastle and are one short of matching Southampton’s full year total of 46 from last season. So that is a concern. 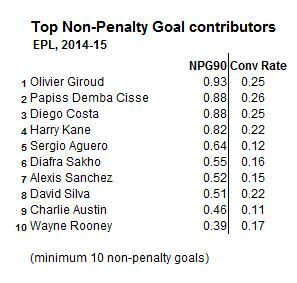 Those boys at the top are running especially hot and Olivier Giroud is the most lethal striker in the league.